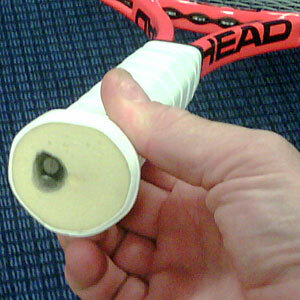 The stiffness of the player’s stringbed is a big concern. I know many people who have developed wrist or elbow tendonitis from using strings that are too stiff. I worry about the long term consequences on a kid’s arm of using very stiff strings from a very young age. I advise my customers – regardless of age actually — to use the softest string possible, and only move to harder strings when they begin to break strings more frequently than they can afford. I was happy to see, therefore, that less than a third of the players were using all monofilament string jobs and slightly more than half were using all multifilament or all synthetic gut strings. The largest group of players were using hybrid strings (stiffer monofilament strings on the mains and softer strings on the crosses), which is a good compromise for people who play and break strings frequently. Interestingly, one of the tournament sponsors, Babolat, gave each player a free pack of RPM Blast 17g. That is 128 sets in total, which is quite generous. I am not certain, however, that it is a good idea for 10, 11, and 12 year olds to be using all-RPMs. I often hear people characterize RPM as a “soft poly.” It is actually a very stiff sting (rated at 280 pounds). What people react to, I believe, is that it is more elastic than other earlier generation monofilament strings, giving it better “feel.” But the fact that it has more elasticity doesn’t mean that it won’t transmit a good deal of shock to the arm of a 11 year old kid. I just strung a Babolat Pure Drive with RPM at 62# and wonder about the long term effect of that on the player’s physical well-being. He did complain about shoulder pain after one of his matches and said (joking perhaps, though perhaps not) that he was going to drop 10# on his rackets after the tournament. Speaking of tensions, almost one-quarter (23.5%) of all of the players we strung for were at 59# or higher, though some of those were stringing with all multifilament strings. The same proportion were stringing at 54# or lower, which I think is a good ceiling for most players (sting low!). No player strung below 50#, though. 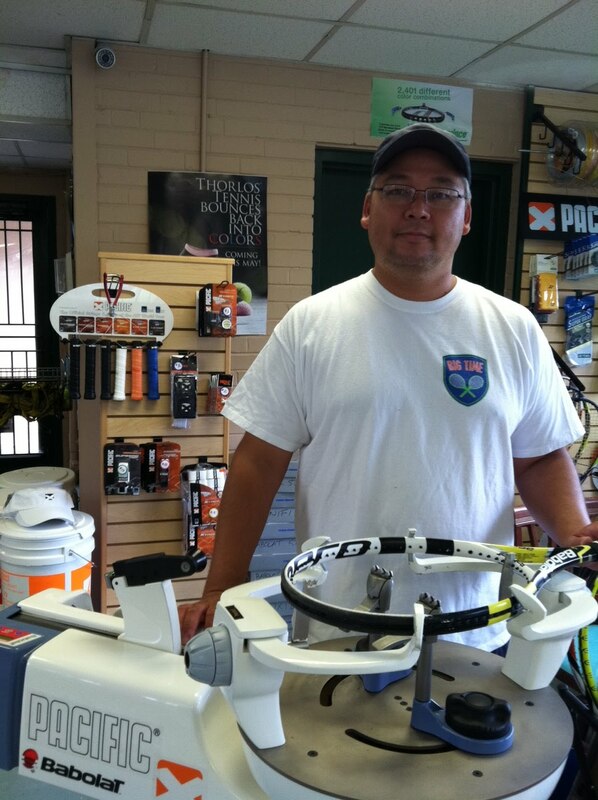 The majority of players strung between 55# and 58#, with the single most popular tension being 55#. In general, I found the string tensions reasonable in combination with the types of strings people were using. In the end, I would say the “typical” racket being used by the players at this tournament was a Wilson with hybrid string job at 55#. The most unique request was for a 9 year old player using a Wilson K-Blade junior model. The mother dropped off the racket and said she didn’t know the tension range, so I was going to string it at the middle of the range with a Gamma multifilament. She came back a moment later and said the kid’s coach texted her the tensions for the racket: 51.5# on the mains, and 50.5# on the crosses! Wake Forest’s men’s tennis team is getting ready to head to Lexington, KY this weekend for the National Team Indoors qualifying against Minnesota, and then the winner of Kentucky vs. Michigan. Wake’s team has an exclusive deal to play Pacific strings and the players use seven different Pacific strings in their set-ups. Interesting factoid from the blog and interview: Davydenko stringing the mains one tension (21k initially, the first five crosses another tension, 17k, then the rest of the crosses a third tension, 19k). This may have something to do with the O-ports on his Prince racket starting on the 6th cross down. Also, check out the post from Day 9 that discusses and shows pictures of Robin Soderling’s handle, pictured below. Notable to me is — with a couple of exceptions — how low these professionals string compared to the average college and amateur players I’ve strung for. I’ve posted about this before in examining pro stringing logs. Caroline Wozniacki (Denmark) – Babolat Aero – Mains Babolat Red, Crosses VS @ 25k. Frank Dancevic (Canada) – Wilson K Blade – Mains Big Banger Alu Pwr, Crosses VS @ 18k. Dmitri Tursunov – Wilson K Blade – mains are Big Banger Ace 112 and Alu Pwr crosses @ 49lbs. Samantha Stosur (Aus) – Bab Pure Storm – mains Big Banger Alu Pwr @ 62lbs, crosses VS with pre-stretch @ 53lbs. Rennae Stubbs (Aus) – Bab Pure Storm – mains are VS with pre-stretch, crosses Bab Red @ 56lbs. Ai Sugiyama (JPN) – Prince O3, mains Recoil @ 50lbs, crosses Prince gut – pre-stretch @ 52lbs. Not surprisingly, alot of Luxilon and Babolat VS gut hybrids. 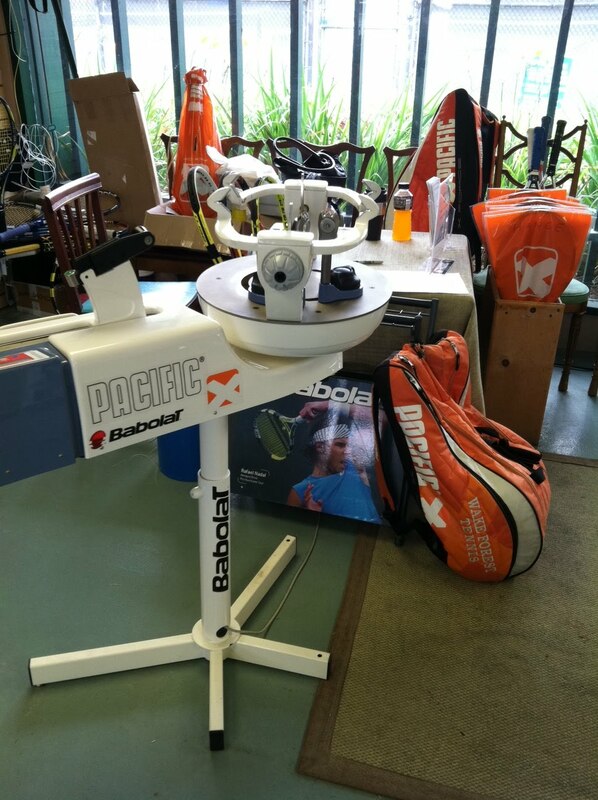 Interesting to see some of the Babolat players using the red “Revenge” string. Haven’t seen or heard much about it, but I’m sure it will be big with the Babolat name behind it.